Postmates, on-demand delivery pioneer and Pink Dot, the iconic Southern California grocery, liquor, convenience stores have entered into an exclusive partnership agreement to provide on-demand delivery to Pink Dot and Postmates customers. When Johnny Reinsh went from being an attorney to a freelance consultant, he like many other freelancers, came across cash-flow problems. Given his longstanding relationship with a well-known bank, with whom he had all the financial products; he went up to them to seek help in his new endeavor. But surprisingly, the answer was “no!”. In order to fix this issue, Reinsch founded Qwil. Qwil focuses on providing working capital for the freelancer who has trouble, like he did, getting paid on time. Because the cost of customer acquisition is high and the typical loan size low for freelancers ($1,000 on average), Qwil works with marketplaces, payment providers and HR platforms to offer its cash advances in their ecosystems. Innovation Nation is a section by Financial Post that focuses on innovation in Canadian businesses. This week, there is an article by Bob Fay that talks about changing or “rebooting” our tax and benefit system. The basis of his argument is that it's not going to support the future of work. He also sheds light on the issue of automation and how it will have effects on our tax system as well. One of the good points that he brings up is that, if automation displaces labour, income and payroll tax revenues will also decrease. Therefore, we will have to think of new ways to completely redesign the tax system. An interesting topic isn’t? Feel free to read his full article here. The Canadian staffing index, which measures staffing activity in Canada, fell 4% in January on a year-over-year basis to a reading of 102. However, the index was up 13% compared to December. According to a new survey on sourcing and managing talent in a gig economy from The Economist Intelligence Unit (EIU), found out that the company decision makers indicate they are increasing their reliance on gig workers to some extent, with more than 60 percent expecting the use of contract labor to grow over the next five years. For more information about the survey and to view the full results, click here. werkapp is making temporary staffing as easy as a click of a button. 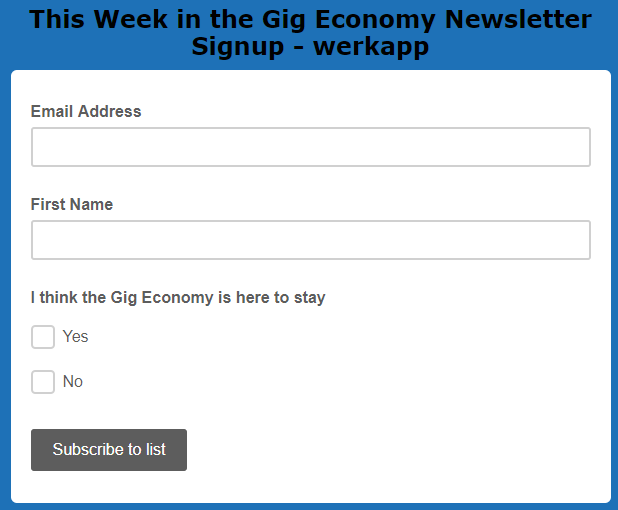 Every week, werkapp will keep you up to date on the latest news in the gig economy.